Hi folks! -Been a while since I dropped in. This plant was one that I waited on delivery for several months - and I live in Tennessee, where the temps can swing wildly later in the year as it is now (end of October). The tree was a delayed ship because they send them out in fall which is supposed to be the preferred planting time. It had many leaves on it in the package, but as soon as I touched it - those leaves all came off it like a green snowfall. I assumed that it was sensitive to being moved, boxed up, cut back EXTREMELY as they do to ship them, and then was also likely very sensitive to temperature and humidity changes. I set it into a large rubbermaid wash tub, the kind with rope handles. It was outdoors for about a month and began to show a plethora of new green leaf and branch growth, but we had a day already where it went down from our usual mid-eighty and above weather to down in the forties. So I brought 'Lime-San' indoors. It does look viable, but I don't know how long it can go without green growth on it. I have it in a room that will eventually become an attached greenhouse, next to my driveway. *I also have 2 other citrus plants, an orange I started from a seed, and a Meyer Improved Lemon that is doing marvellously! I mist all three of my "Tree-San's" several times a day, it is a pleasureful and relaxing sort of ritual in my daily routine, I keep the spray bottle full for whenever I am passing by. I take it that this is normal for these trees, and why the lime in particular was held until late in the year when it might be expected to drop leaves anyway. Do I have any real cause for concern? 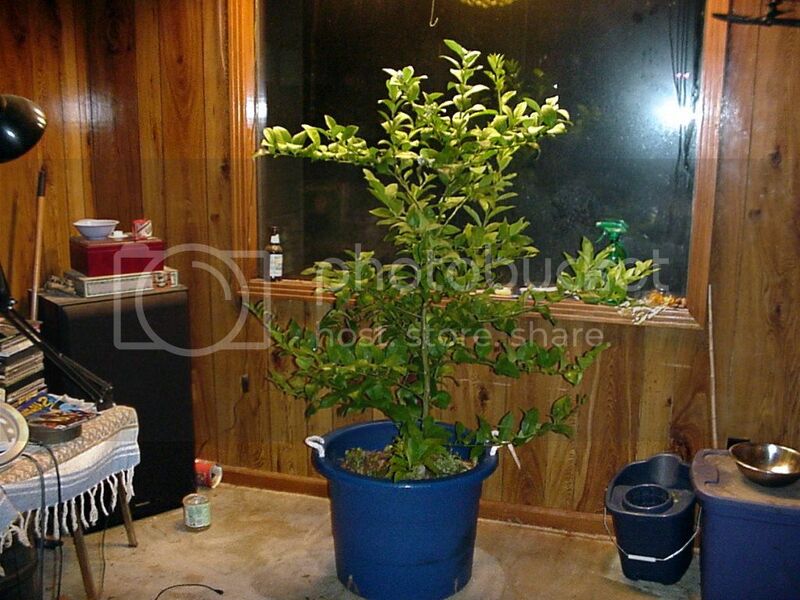 If I keep this tree in the greenhouse room year round, would it help keep it from being affected like this anymore, or is it better to get it outside during the warm season and not baby it? how well your lime is doing. It seems to take quite a while to recover, but I'm seeing the very beginnings of new growth on it now. Very tiny new leaves have started at the very top of the main trunk. 2 weeks so far, for a bare beginning. But it looks hopeful. I have a small electric heater in that room dedicated just for the trees in there. I don't let it drop below 70 if I can help it. Hey Greywolf. Ken here. The photo of your lime looks promising. Keep up the good work. IÃ¢â‚¬â„¢m rootinÃ¢â‚¬â„¢ for it. Take care. I think that your lime will recover. I've had my citrus leaves drop a lot when I first do anything changing them. Then they bounce back pretty quickly. I'd suggest taking it out of the pot, loosening up the rootball and plantin gw/ new soil and a litter fertilizer - in the spring if yo udon't plan to move it out or now if it staying in the same spot forever. Just looking for some feedback on my key lime.